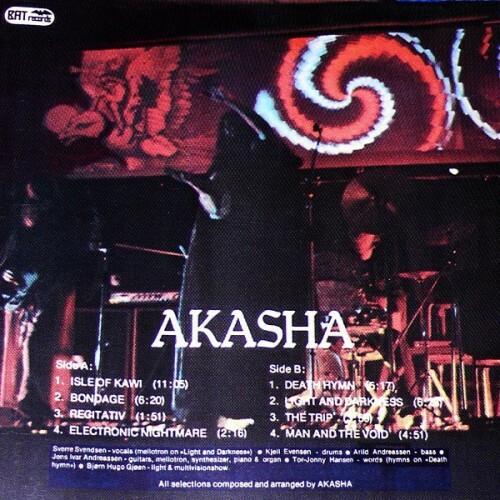 AKASHA is a Norwegian quintet who recorded one strange and fascinating album back in 1977. They are: Kjell Evensen on drums; Arild Andreasson on bass; Jens-Ivar Andreassen on guitar, mellotron, synths, piano and organ; Tor Johnny Hansen is credited for lyrics on one particular track; and Sverre Svendsen handles the mellotron as well as the English vocals - highly reminiscent of Greg Lake, by the way. Musically speaking, comparisons aren't easy: try to imagine a blend of early GENESIS and the MOODY BLUES, albeit a much harsher, stranger version of the latter. 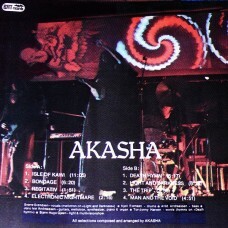 AKASHA write dark and foreboding prog and lyrics with a strong sci-fi bent. The LP version of their album is now a collectors' item, commanding 3-digit prices on the underground market; even the small Swedish label (APM) that issued its CD version in 1995 has now ceased to be. The music on their self-titled album (which dons an epic 11-minute opener) is loaded with synths, mellotron and spacey effects that will no doubt send fans straight to 'tron heaven (the mellotron features prominently throughout the album, relegating the guitars to a secondary role). Jens Andreassen exploits his synths to the fullest, wrenching out a variety of experimental analog sounds and noises (what he does with filters and oscillators is simply amazing). The only problem with the album is its poor sound - it was recorded in a bomb cellar of a hotel, in the town of Finnsnes. Except for this flaw, "Akasha" is brilliant and a true gem of underground Scandinavian prog. If you fancy plenty of mellotron and spacey experimental sounds (and don't mind a 'so-so' production), no doubt you'll have your hands - and ears! - full with AKASHA. (from Prog Archives).